This page provides you with Freelancer resume samples that you can use for inspiration in writing your own resume, or for creating one through our easy-to-use resume builder. Below you'll find our how-to section that will guide you through each section of a Freelancer resume. Freelancers are self-employed individuals who offer services to their clients. Nearly every type of service needed by most businesses could be provided by a freelancer. Some of the most common freelance opportunities include: Accounting/Bookkeeping, Graphic Design, Marketing Project Management, Social Media Manager, Teaching/Tutoring, Virtual Assistant, Web Design/Development and Writing. This guide will be about a generalist freelancer and can be tweaked to use for specific services. Creating resumes can be tricky even if you have a straightforward career, it’s even harder for freelancers who work various projects. Not only do you have to grab the client's attention, pitch your skills, and prove that you're the best person for the job, you also have to make sure that the breadth of your experience makes you look accomplished, not scattershot. Our resume samples have been made to help you stand out from the crowd and have been trusted by over 3 million people. Award-winning freelance writer, editor, and social media manager with 10+ years’ experience creating online content to improve top-funnel acquisition. Driven writer and blogger with 3K+ active monthly readers. Editor at University journal which received 95% positive feedback from management for creativity. Consider the following tips while describing your work. Try making a “skills-focused” resume rather than creating a chronological resume Customize your resume to fit the job you want, prioritizing projects relevant to the job. Quantify your achievements as much as possible. 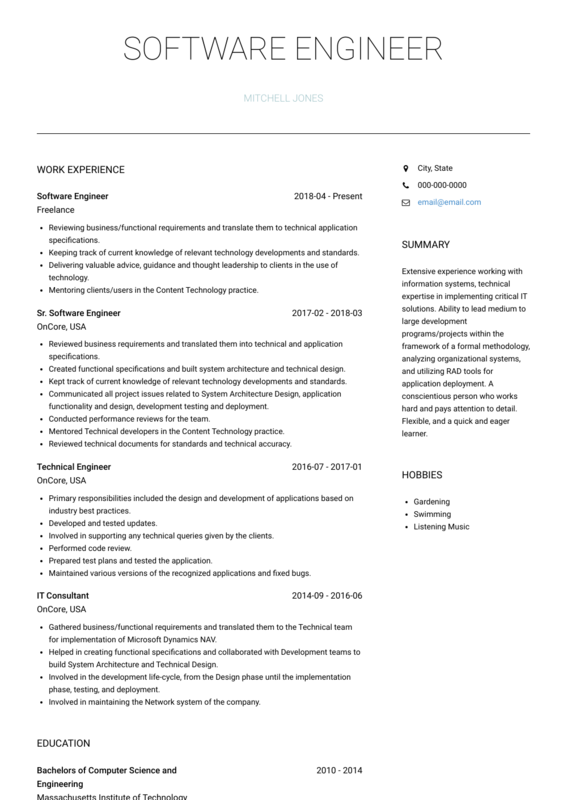 In VisualCV, you can create a Master resume with all your projects and then make copies of that resume. Customize each copy for the specific job you are applying for. You can use the above method for other services such as design, web development etc. Education section should clearly show your degrees, courses or certifications that you have completed. There is no reason to include your GPA if the job that you’re applying for isn’t your first one. Unless, of course, your GPA is very impressive (definitely if it’s perfect). Received Roy Scrivner Research Grants to study Adolescent behaviour. You should also use this section to add any certifications you might have that are relevant to the job you’re applying for. This is a very important section for a freelancer’s resume as client’s are searching for specific skills that their hire must have to complete the job. The best way to know which skills to add here, would be to look in the job description itself and add those skills and related skills in your skill section. Nonetheless there are soft skills which every freelancer must have and we have made a list of them. Keep your work samples between 3 to 10. To show your client’s that you are really passionate about the field, it’s nice to add things that you do outside work and school.